Digital Extremes wants you to know right out of the gate that the soldiers in supersuits at the heart of Warframe are not actually soldiers. Rather they're ninjas, the kind that sneak about, dash along vertical surfaces, and strike enemies down with swords. Here's the thing, though. Treated as a perfectly satisfying (albeit somewhat generic) online shooter, Warframe is disarmingly deep, and best of all, free-to-play. But then the ninjas--with their nonsensical "Tenno" and "Grineer" proper nouns, their exoskeletons, and their zombies--introduce something convoluted and incomprehensible. Shoehorn in some clumsy platforming and melee combat into an otherwise solid framework, and what you're left with is admirable ambition, but a hot mess in terms of execution. At its core, Warframe is all about cooperative, third-person running and gunning. It's set on and around the planets of our own solar system, but good luck pulling anything out of the game's impenetrable plot beyond that. 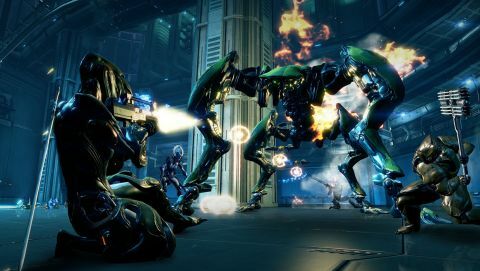 Players don superpowered suits--the titular Warframes--and unleash hell on whatever it is that they're fighting, via guns, swords, and special abilities. The game's big selling point is its dungeon-crawler-esque grind. The range of guns and equipment is impressive, and Warframe generously doles out the money and materials needed to build them. Suits and weapons are fully customizable, and the numerous missions, though randomly generated, rarely feel flat or insubstantial. There are currently over a dozen Warframes available, and they all have awesome powers--like fireballs, venom attacks, or outright invisibility--that allow players to forge their own approaches to combat. It's the uncommon multiplayer shooter that makes every participant feel individualized, the product of endeavor and reward. Because Warframe is a free-to-play title, it puts a massive emphasis on microtransactions. That's perfectly fair, of course, but it means that manually unlocking content is a steep uphill battle, necessitating both the blueprints for new items and the components required to actually construct them. And that's not to mention the considerable number of credits needed to purchase everything. Any players who aren't immediately won over by Warframe and don't want to pay for more content might be missing out. The Warframes actually do handle quite differently, but the amount of effort it takes to unlock just one of them beyond your initial starter means that actual experimentation is out of the question for all but long-term players. Having said all of that, you could shrug off Warframe's wealth of options (and a knotty interface) and just enjoy it as a straightforward online action game. The objectives, while boilerplate on paper--capturing designated targets, sabotaging key pieces of equipment--are varied enough that the game never feels too repetitive, and Warframe also sports some of the best procedurally generated levels in recent memory. They're also surprisingly large in scale; it'd be easy to get lost in them if not for the included minimap and waypoint system. While Warframe began as a PC title, it's made the transition to PlayStation 4 fairly smoothly. While the decidedly unimpressive texture work doesn't make Warframe a showcase for the console's graphical prowess, the game does run steadily and sports few of the bugs present in the original PC build. It might be a stretch to call this the definitive version of Warframe, but it's not a shoddy port by any means. Plus, the basic shooting handles quite well with the DualShock 4. Unfortunately, Digital Extremes haven't bothered to fix the mechanical issues that plagued the original release. For one, the melee combat is surprisingly cumbersome for how much the game pushes it as a key feature. Your character has a habit of lurching forward with every strike, and thus continually hacking away at an enemy requires that you mindlessly flail about while the camera cranks and pivots and can't keep up. The parkour platforming fares even worse; it's floaty and imprecise, and your so-called ninja tends to bound in a random direction at the end of every wall-run. While Warframe's character customization is deep and the gunplay is relatively exciting, it's nothing you haven't seen a thousand times before. The only truly standout element is the visual style, particularly concerning the bizarre character design. It borders on overachieving, but given how generic the rest of the package is, it's difficult to commend that particular aspect of the game for going the extra mile. Is Warframe worth sinking your teeth into? All you have to lose by checking it out is the considerable amount of time needed to install it. And who knows, maybe you'll be absorbed by the expansive upgrade system and deep well of content available here. But even if you pour tons of hours into upgrading your badass Warframe, the game's more shoddy features, sadly, never get any better. Warframe brings solid gunplay and a rich infrastructure to the PlayStation 4 in a rare free-to-play model. It's a missed opportunity on some levels, but if you're itching to get more use out of your new console, give it a whirl. Description Take on the role as a space ninja and slice your way through or alongside friends to find artifacts that will upgrade your character.